Israeli forces began shelling a United Nations girls’ school today, where hundreds of Palestinians have sought refuge since Israel’s attacks began two weeks ago. According to Chris Gunness, spokesperson for UNRWA, the UN agency for Palestine refugees, Israel shelled the school and then shelled it again when humanitarian aid workers went to investigate the damage. On Monday, Gunness stated that more than 100,000 Palestinians have been internally displaced from their homes in Gaza and have sought refuge in 69 UN facilities, including the Maghazi girls’ school. Gunness added that the number of persons seeking sanctuary has risen by more than 400 percent in the last four days. Al Jazeera Arabic reported than 73 Palestinians were killed on Tuesday alone in the latest series of attacks, bringing the death toll in Israel’s two-week-long assault to over 600. Defence for Children International - Palestine Section released a report today confirming that of the 600 dead, at least 95 are children, with a further 65 cases being investigated by the organization. The aid agency UNICEF’s initial estimates are higher — it stated that 121 children have been killed, including at least twenty who were killed during Israel’s massacre in the Shujaiya neighborhood on Sunday. “Over eighty of those killed are 12 or younger,” reports Ma’an News Agency. UNICEF estimates that one-third of all civilian casualties are children. During an interview with The Electronic Intifada on Sunday, Dr. Belal Dabour of al-Shifa Hospital reported that children made up the majority of those who arrived with serious injuries sustained during the Shujaiya massacre. Dabour added that many of these children will have life-long disabilities or will remain severely disfigured. 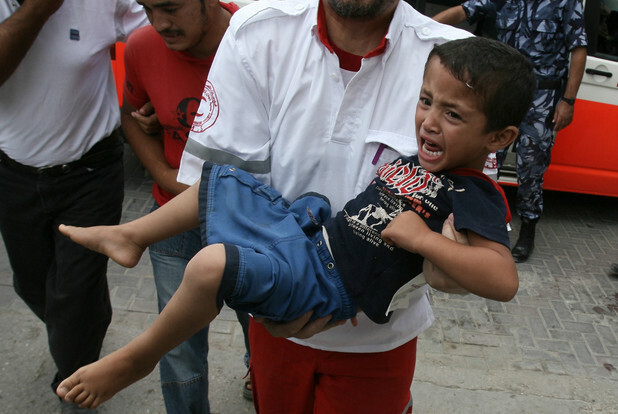 The numbers of child fatalities grew rapidly as Israel continued its ground attacks on the Gaza Strip, with day three of the invasion, Sunday, 20 July, proving the deadliest yet. In Khan Younis, 19 children from the same family were killed when bombs from an Israeli aircraft destroyed their home. A further three children across Gaza lost their lives on the same day. … Dina Rushdi Omar Hamada, 16, died when her house in Gaza City was targeted by a drone missile. In the southern Gaza town of Rafah, 16-year-old Anas Mahmoud Hussein Muammar was targeted by a drone missile as he sat with his brothers on the balcony of their apartment, drinking coffee. He was pronounced dead in hospital after sustaining critical injuries. At al-Bureij refugee camp in central Gaza, 12-year-old Shaaban Jamil Shaaban Zeyadeh was killed along with six of his family members as they tried to evacuate their home, which was bombed in an airstrike. 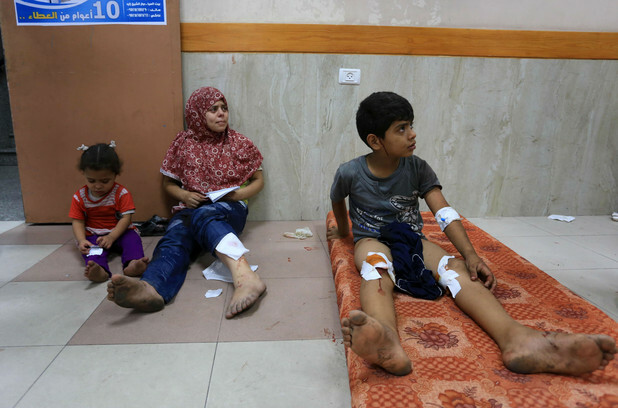 The UN Office for the Coordination of Humanitarian Affairs stated today that “At least 107,000 children require direct and specialized psychosocial support on the basis of families who have experienced death, injury or loss of home” since Israel’s attacks began on 8 July. 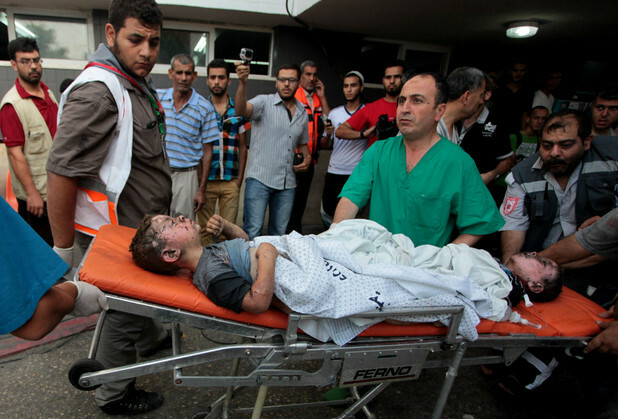 Ma’an reports that more than 900 children have been injured in Israel’s attacks. “Shrapnel wounds, severe burns, and the loss of limbs account for a high rate of critical injuries which will require long-term attention and severely impact the victims’ future quality of life,” the agency adds. One day children have a large family and the next day they are orphans. The practical implications of this will affect them forever. Children grow up in a environment where they realize they have no security in their own homes. Even their bedrooms are not safe anymore. DCI-Palestine lists the names of the children from the Abu Jami’ family in Khan Younis. “All were sheltering in their four-storey house when the strike occurred without warning,” the organization says. I WOULD LIKE TO RECEIVE MORE ARTICLES ABOUT THIS SITE. I DEFEND PALESTINIAN PEOPLE. AND WHEN I SEE ISRAEL KILLING YOUN PEOPLE, ELDERLY, KIDS, AND WOMEN, MY ANGER BECOME EVERYTIME STRONGER. I HOPE YOUR REPLY. BYE. There is no excuse or defense for the deliberate killing of Palestinian children. And there is no excuse for the world looking idly on while gratuitously calling for 'Israel's right to defend itself'. What we are seeing is not defense, but calculated murder of the most helpless and vulnerable children. Israel is a war criminal and will one day be held accountable. I am a Jewish woman in support of Palestinian's, and a member of SJP. Today, I attended a rally to protest a pro-Israeli rally. We were taunted, videotaped by our police department and pro-Israelis. One of our members was attacked by a pro-Israeli as he crossed the street peacefully. When he defended himself, he was arrested, but the other guy was not. They called us Terrorists, and I asked them why children, hospitals and Reuters office in Tel Aviv was bombed? I am so sickened, and want to know where my God is? How is this allowed? I know the political reason, but hurt so badly to see my own people, use Gestapo tactics to intimidate us. My heart hurts so bad. God bless you for your humanity. I was curious can someone explain to me why it is still kids in Gaza if they are in war because I would have walked with my kids to the desert then to stay and wait for Israhell to blow us up...so why didnt they go to UN shelters or are they not able to leave?? I know they cant go outside the country but anywhere else? Palestinians are not allowed to leave Gaza at all. They are locked in, literally. Of course, all mothers would take their children and flee but they cannot get out because the Israeli army will not allow them to leave. They seek shelter for their children and themselves in places they think are safe, like UN schools, and the Israelis bomb them there, too. Gaza is one of the cities with more density in the world. Around 1.8 million people leave there, mayority kids. It is an strip that has been suffering a blockage and siege from many years.